The Committee on Capital Markets Regulation today released data on the total public financial penalties imposed on financial institutions in the United States for Q3 2015. Public financial penalties include public class action settlements that arise from class action lawsuits brought by the government (e.g., state attorneys general) and regulatory penalties that follow enforcement actions by regulatory agencies including the SEC, CFTC, and others. Through the third quarter of 2015, total public financial penalties this year have reached approximately $15.9 billion, with the third quarter adding over $2 billion of penalties to the $5.7 billion and $8.2 billion imposed in the first quarter and second quarter, respectively. The year-to-date total of $15.9 billion in penalties contrasts with the historically unprecedented $51.7 billion in aggregate penalties imposed through the third quarter of 2014. Similarly, the roughly $2 billion in penalties assessed during the third quarter of 2015 is lower than the $29.9 billion imposed during Q3 2014. This disparity is likely attributable to the absence of multi-billion dollar settlements this quarter, which have otherwise fueled penalties data in recent years. The Q3 2014 results, for example, were buoyed by $16.7 billion and $7 billion settlements paid by Bank of America and Citigroup, respectively. 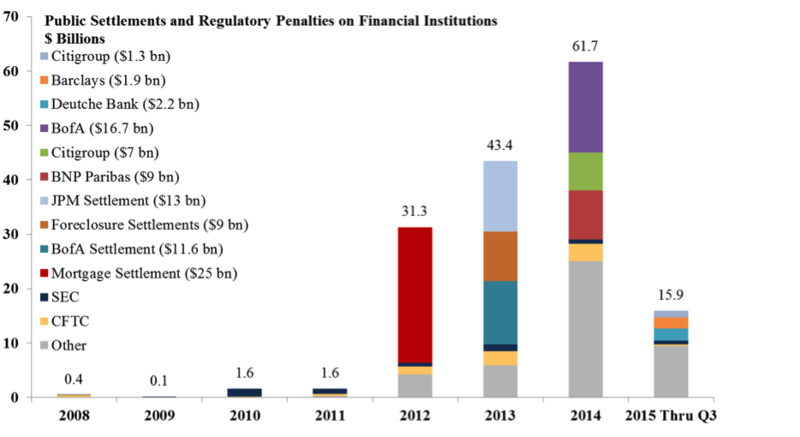 Nevertheless, the data show that 2015 has continued a trend in recent years of historically unprecedented penalties imposed on financial institutions in the United States. A PDF of this report can be read here.